Nee-On is a dance troupe that will wow anybody who sees them. Wearing neon clothing, they delight in entertaining all ages with their smooth moves and superb choreography. When Trevor George was contacted to provide them at a football stadium we were intrigued. The act tends to look better at night but as you can see from the photos, it was a daytime excursion. Would it work? 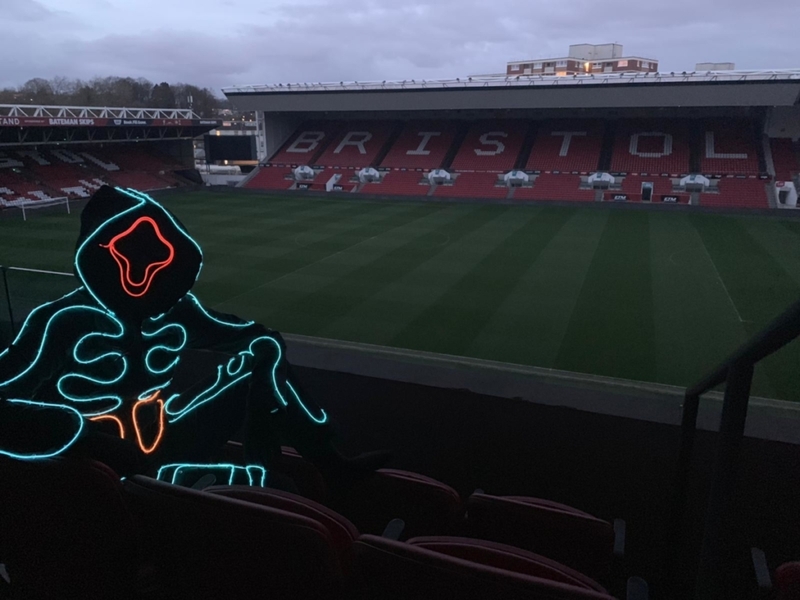 We popped along to Ashton Gate in Bristol to find out! The answer to our query is of course ‘no’. Nee-On only really works when it is completely dark because that way the act comes to life! The dancers perform on a stage with no lighting and it is only when their costume lights up that guests will see them. This creates a fab opportunity for dancers to disappear and reappear elsewhere and also creates an illusory effect with certain moves. 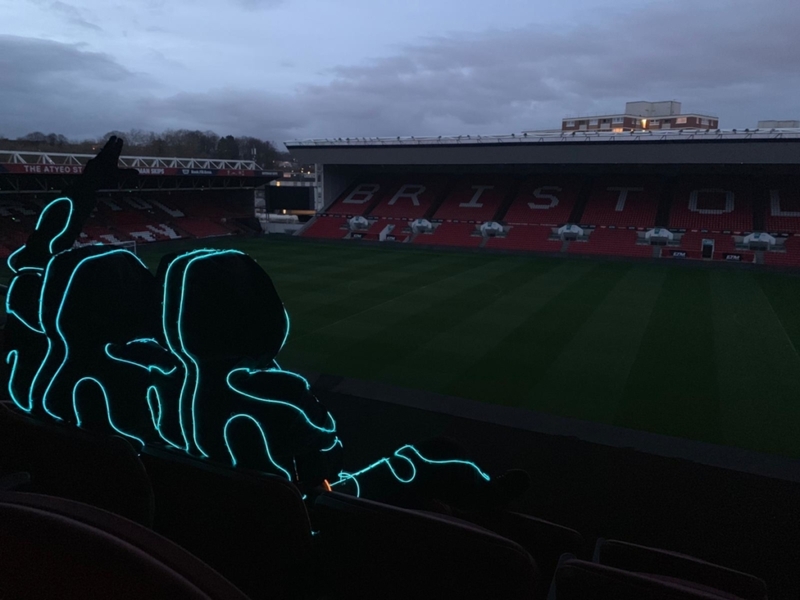 Thankfully, the photos you can see were the only part of Ashton Gate that the dancers saw in advance of their slot. As you can see, they really create an impression when wearing their full outfit. So now we come to the truth of the matter – Nee-On weren’t due to perform outside in the stadium at all! 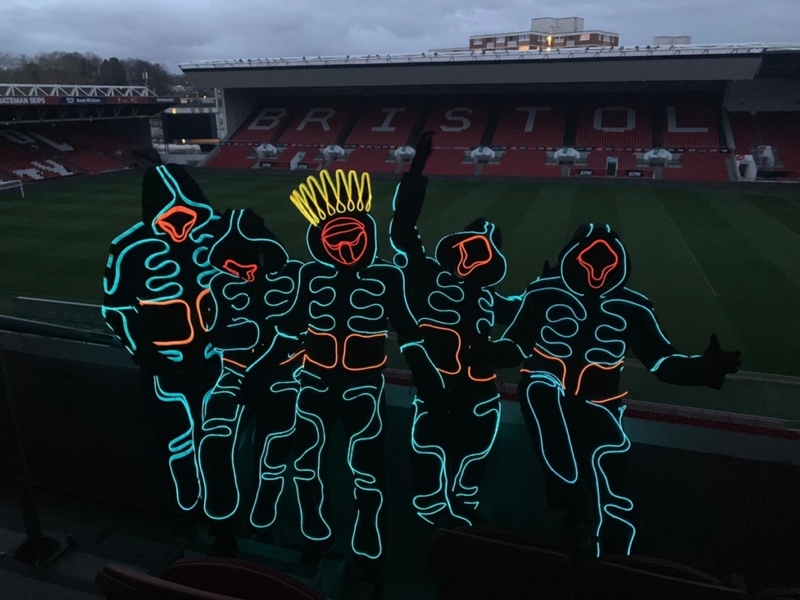 The five dancers actually took to the stage in the Lansdown Restaurant, a performance space with a maximum capacity of one thousand people. Modern stadiums don’t only play host to sport but can also be used for conferences or other events. With their six minute headline show, Nee-On brought the house down! We were lucky enough to be able to film some of it and we hope you enjoy the video below. If you are looking for a high impact dance piece to wow the crowd at your next event, we highly recommend this act.